Executive pay package stock options have fallen in prevalence and prominence over the past 15 years, having been replaced primarily by long-term, performance-vested stock plans. Many companies struggle to set rigorous yet fair long-term performance goals or define an appropriate peer group against which to measure relative TSR. Setting appropriate performance goals is critical for performance share and similar plans because full vesting results in executives realizing the targeted number of shares at their current value. Performance-vested stock options simplify long-term performance goal setting because gains realized by executives require both satisfaction of the performance vesting conditions and increases in company share price. Vesting by itself does not guarantee any gain, and gains are scaled not to competitive pay targets but to increases in shareholder value. This enhanced shareholder alignment makes setting rigorous performance goals less critical than it is for performance share and similar plans. The characteristics of performance options may make them the best fit in many situations. As such, companies should consider them when evaluating long-term performance plan design alternatives. In the early 2000s, several large companies — including Enron and WorldCom — collapsed due to fraudulent business practices linked to the extensive use of stock options. As a result, stock options were given a “black eye” by the business press and frequently cited as motivating unhealthy — if not unethical — practices to pump up short-term results at the expense of long-term sustainable gains in shareholder value. In 2006, the accounting profession mandated a major change to the accounting treatment of stock options. For the first time, accountants required a direct charge to earnings for the grant of stock options, eliminating the comparatively advantageous accounting treatment afforded options for more than half a century. In 2010, the SOP shareholder advisory vote on executive compensation — included by Congress as part of the Dodd-Frank Financial Reform Act — greatly enhanced the influence of proxy advisory firms. Some proxy advisors have taken the position that a typical stock option (i.e., with a strike price equal to the company share price at grant and exercise rights vesting over time) is not performance-based compensation. Instead, proxy advisors advocate long-term performance plans that vest or pay out based upon achievement of nominal or relative performance measures. A sufficient number of institutional investors have supported this view, causing many companies to feel pressured to grant >50% of LTIs in the form of such performance-vested awards. share prices often move for reasons that are not directly connected to performance. For example, economists estimate that at any point in time, >50% of a share’s price is determined by factors beyond company performance. Some of these factors are common to all stocks, such as the discount rate for capitalizing future earnings, but other factors may be specific to an industry subset or a particular company, such as M&A expectations. Performance options use the familiar stock option vehicle to reduce the challenge of setting long-term performance goals, and the risk of setting unfair goals, while delivering payouts that are completely aligned with shareholders. ‍ How do PSOs reduce the challenge of setting long-term goals? PSOs require an increase in share price to generate realizable gains on exercise, and so the risk of vesting and paying out large gains for achieving “easy” goals is greatly diminished. In contrast, rigorous goals are considered essential to PSU awards due to the large gains that are immediately realized upon vesting. For low share price growth rates (4.7% or less), PSUs provide more realizable value after year 3 than do PSOs after year 7. At a 15% share price growth rate, PSOs provide similar realizable value as PSUs after year 3 but offer far greater upside opportunity in subsequent years if high share price growth continues. The illustrations also indicate that for share price growth rates between 4.7% and 15%, PSOs require 4 to 7 years to provide a similar realizable value as PSUs after year 3. PSOs provide gains to executives in proportion to gains realized by shareholders (i.e., a significantly lower realizable value at low share price increases, and a significantly higher realizable value at higher share price increases). In contrast, a company issuing PSUs could achieve its operating goals — or rank high on relative TSR — but still have a very low TSR for shareholders while paying out target or greater gains to executives. The performance orientation of PSOs is generally longer than that of a typical 3-year PSU due to the time required to generate gains and the 7 or 10-year term for exercising them. Because vesting of PSOs is no guarantee of significant gains, shareholder concerns over vesting goals should be diminished, and companies can set goals with less “stretch” than what is expected for PSUs. An analogy to setting less “stretch” in goals can be found in RSU awards that generally vest over time but also require that a specified level of performance be achieved as a precondition to the time vesting. This design is used to qualify the RSUs for a company tax deduction under IRC § 162(m). Shareholders, shareholder advisors, and the IRS have viewed many such plans as “performance based” and qualified for a tax deduction so long as there is a significant risk associated with achieving the performance criteria for vesting. Tax qualification isn’t generally an issue for stock options with an exercise price set at grant date fair market value: the IRS presumes they are performance based. However, this recognition from shareholders and their advisors is important to shareholder relations and SOP voting. 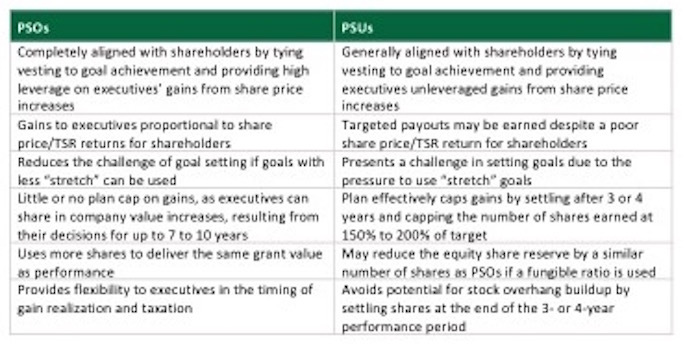 Considerations in selecting PSOs or PSUs are highlighted in the table below. When Should Performance Options Be Considered? desire to provide uncapped upside gains proportional to increases in company market capitalization. 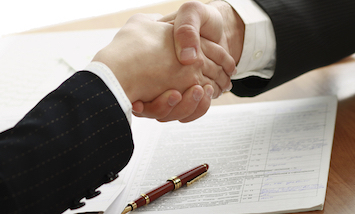 PSOs that are properly understood and designed may provide the best fit for many companies. They should be considered whenever companies evaluate long-term performance plan design alternatives. 1. CEO Pay Trends 2016: Aligning Pay and Performance to Create Shareholder Value. Equilar. June 15, 2016. http://marketing.equilar.com/2016-ceo-pay-report. General questions about this Viewpoint can be directed to Jack Marsteller, John Ellerman or Chris Brindisi by email at: jack.marsteller@paygovernance.com, john.ellerman@paygovernance.com, or chris.brindisi@paygovernance.com.